The beautiful Skyview Bar is located in Burj Al Arab, Dubai – enjoy the cocktail, afternoon tea with menu – find the dress code, timings and reservations info. Dubai is popular for its exquisite style and extravagant hotels offering breath taking views of the gulf as well as the expansive modern city. One of the major hotels of Dubai is the Burj AL Arab standing high on the artificial island on Jumeirah Beach Road housing extravagant restaurants and snack bars. This sail shaped building is the fourth tallest in the world and has the Skyview Bar perched at a height of 200 feet from ground level at level 27. 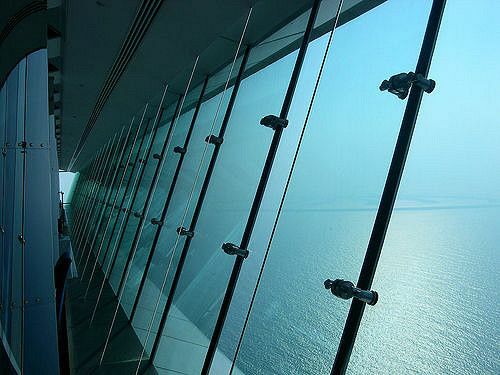 True to its name, the Skyview Bar offers a panoramic view of the Dubai skyline and the Arabian sea. The entire bar is enclosed by roof to floor crystal clear glass and the roof is designed like fish scale lit up with blue and green hues. The decorative theme is simple, uncluttered and oozes luxury with fine glassware and plush settees. The entire experience is made private with small seating spaces, with a continuous plush sofa lining the bar front offering ample privacy and comfort. For ones who are alone, single tables and chairs are lined up against the glass casing to seep in the magnificent view of this gulf city and not get bored. The night sky offers million twinkling stars over yet another sheet of twinkling city lights spread across the city. The dazzling view I a reason enough to spend some time sipping some refreshing mixtures. The bar is yet another spot worth mentioning. Snuggled beyond the seating area hued in blue, the bar is all glittery and glass dominated. Things get busy as master mixologists whip up some secret recipe to create unforgettable tastes that linger not only on the taste buds but also the mind. The electrifying drinks are made interesting with beautiful glasses and interesting garnishing served at lightning speed. The music is enthralling and engaging which keeps the mood lifted at all times. For entertainment the Harpist is appointed for all weekdays. Cuisine offered involves light savory snacks, drinks as well as afternoon tea. The restaurant is strictly a non-smoking zone and allows individuals only above 21 years of age. Reservation are generally done within a given time slot of two hours, afternoon onwards and prices range between 350-650 AED per person. Beverages are served from seven in the evening till 2 in the night and minimum order value is 350 AED for beverages. Dress code is semi-formal for men with jeans and t-shirt or colored shirt with long trousers. For women it can be a fitted skirt, dress or gown or long tops with slacks. No trainers or sportswear is allowed. National dress of UAE is also allowed. The bar is open from Saturday to Thursday, with Fridays being closed for the afternoon tea. One can choose from the afternoon slot to get a clear sparkling view of the emirate city or get into the groove of the night sky and peppy music. The best time to spend some memorable time with friends and family is the evening time to witness the glorious sunset over the horizon of the gulf. The red yellow golden light glimmers through the magnanimous glass casing to impart an unforgettable memory built with the Skyview Bar premises. The bar is also famous for surprise personalized events, discounts and even might place a piece of cake for an ongoing birthday celebration!